Sometimes holiday dinners can get a little bit boring, especially when Grandma breaks out that dry oven-roasted turkey again. Smoke the Thanksgiving competition in style with this clever DIY—and infuse your bird with flavor! Just like us, our ancestors loved a good cookout. As early as 500,000 years ago, the earliest humans whipped up dinner over an open fire. Over time, however, they discovered that smoking meats preserved them, and cooking methods improved to keep food fresh for longer. Today, the technique is more of a treat than a necessity, but this clever DIY smoker from Instructables member DrEel aims to change all that. For tender turkey with a smoky kick of flavor, forget the oven and bring that bird to the backyard! 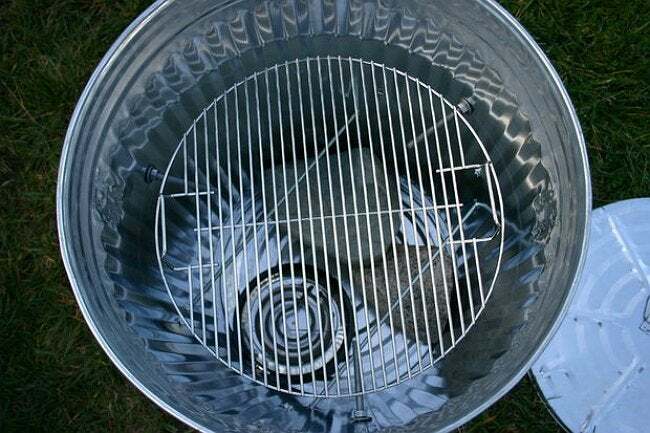 With little more than an adventurous spirit, a circular grill grate, and a trash can—yes, you read that correctly—this maker went to work. As it turns out, a brand new garbage can works just like a large store-bought smoker, using convective heat from the smoking wood chips to cook and flavor your family-sized bird. To transform the trash can into a full-fledged smoker, DrEel first drilled a series of holes to establish a few levels. Three equidistant holes about 8 inches below the rim (a little more than the height of the turkey) fit 3-inch-long bolts to support the grill grate and the bird. Several inches below that, four more holes and a pair of threaded rods suspend a foil dripping pan—a smart addition that prevents grease fires and minimizes any mess. At the bottom, one final hole is drilled to thread the electrical cord of a $10 electric hotplate to an outlet outside of the can. Come Turkey Day, this Instructables user stationed the smokey contraption a safe distance from the house and neighbors using a high voltage extension cord. Inside the bottom of the can, the hotplate (set to the highest temperature) warms a small pan of water-soaked applewood chips. The smoke and heat circulates within the lidded smoker, cooking the brined turkey resting on the grate. A small BBQ thermometer punched through the lid reads the temperature inside over the course of the afternoon. Ultimately, the weight of your bird will determine cooking time. 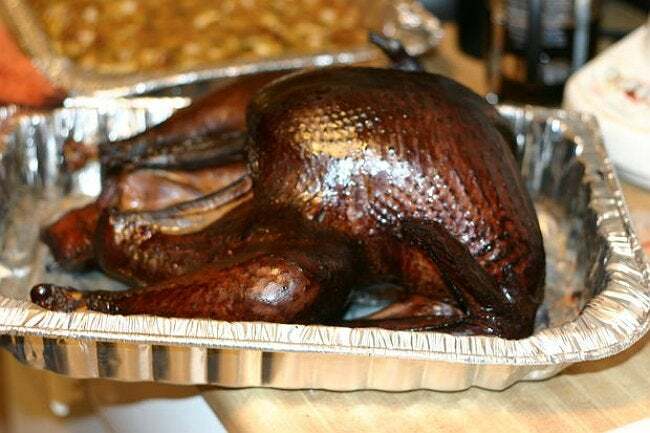 A rule of thumb: Give yourself at least 30 minutes for every pound of turkey to cook all the way through. (A 16-pound bird, then, will be table-ready in about 8 hours.) And remember, the best things in life are worth the wait—and a great meal is no exception. Ready to get cooking with this holiday DIY? Just remember to take proper precautions. Keep a fire extinguisher nearby, and always opt for a stainless steel trash can over one made of galvanized steel—studies have shown that the fumes produced by galvanized steel at high temperatures can be harmful. Safety concerns aside, there’s nothing like making your own Thanksgiving tradition, especially one this cool. At the very least, we guarantee it will be the tastiest thing you’ve ever pulled out of a trash can!